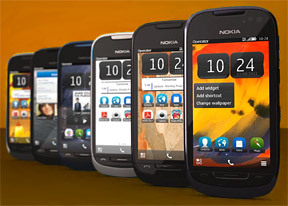 The Nokia 701 comes with an 8MP fixed-focus camera for a maximum image resolution of 3264 x 2448 pixels. In dark scenes, a dual-LED flash lends a hand. The user interface has changed since Anna (it's even different from the Nokia N8 camera update), but the changes are mostly cosmetic. At the bottom of the screen, you get a row of shortcuts: Back, Flash mode, Scenes, Extended options and Menu. The latter lets you toggle between the front and rear camera, launch the user guide or exit the camera app. On the right, there's a the virtual shutter key (often preferable over the physical one, which is hard to press) and a toggle for the still/video modes. On the left, there's a digital zoom lever that auto-hides. In the extended options you get more goodies like face detection, self timer, image settings (ISO, white balance, sharpness, etc.) and a shortcut to one last group of settings where you have geotagging and capture tone options. We were sorely disappointed when we tried to change the ISO setting - it's a list (Auto, Low, Med, High) and you tap once to select and once again to activate. The Sharpness setting works the same way. Really, Nokia? It's just sad to insist on this ham-fisted approach to menus with each new version of the OS. Anyway, as far as image quality goes it's actually improved since the Nokia C7. The default settings no longer produce over-sharpened the image, though you can see halos around high-contrast areas and the images turn up a little grainy because of the sharpened noise from the sensor. Still, the Nokia 701 captures good amounts of fine detail. One thing that could be improved is the dynamic range - contrast is good but at the cost of blown out areas in the image. We tried reducing the sharpness setting in the camera and that helped out by taking a lot of the graininess out of the photos. That, of course, made the image noticeably softer - ideally, you'd shoot with sharpness set to "soft" and sharpen images manually later. If that seems like too much hassle, go with the default settings - they're good enough. The video camera captures 720p@30fps footage with stereo sound, courtesy of the dedicated second microphone. The user interface is virtually identical to the still camera interface. Among the options are scenes, video light, video stabilization, you can toggle audio recording and geotagging. There's a great grid option, which not only shows the rule of thirds grid, but also marks the viewfinder in a cinema-like 21:9 frame. Video capture was one area where Nokia's 8MP fixed-focus cameras perform surprisingly well and the Nokia 701 is no exception. Videos are shot in MP4 files with about 10Mbps bitrate and 127Kbps stereo sound at 48 kHz, which earns points for the 701. Videos run at a smooth 30 frames per second, with no duplicated frames. The amount of captured detail is good, but again the low dynamic range leads to blown out areas (the shadow in the trees and the clouds, for example). Check out the quality for yourselves, here's a sample we uploaded to YouTube:. And here's a 720p@30fps (18.2MB, 0:12s) video sample straight from the Nokia 701 for direct download.